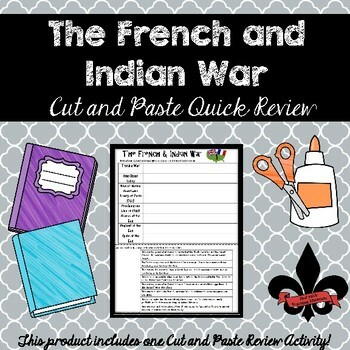 Have your students review different concepts surrounding The French and Indian War with this interactive cut and paste activity. Have students match each concept with its description in this quick review. Use this as an entry in an interactive notebook or as a stand alone review activity. All the teacher needs to do is make a copy for each student. Students will use their textbook or other resource to put the description next to the concept being discussed! 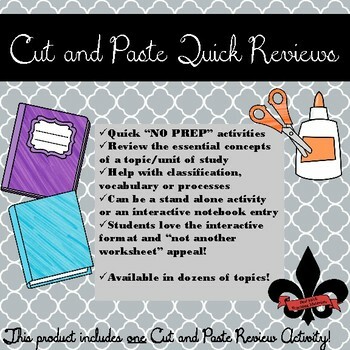 Do you want to own every cut and paste activity in my store and access to all future cut and past activities? 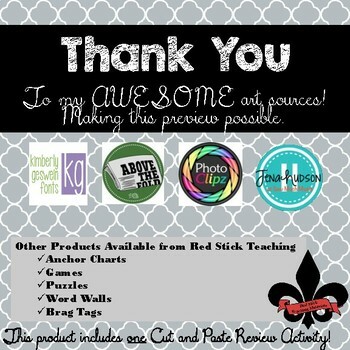 Then check out my Cut and Paste Growing Bundle. This items is also included my Ultimate Early American History Bundle! If you like this product or are looking for more hands-on social studies resources, please follow my TPT store. This way you will receive updates when new products become available. Also, remember to leave feedback on all purchases to earn credits towards future TPT purchases. Please see my TPT store for many more interactive social studies activities!